We are offering of Notch Trowel. 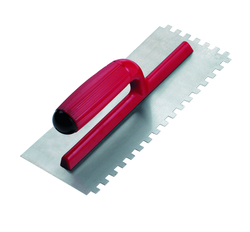 Notched Trowel for various Masonry and Construction application. Available in Various sizes and notch variables. We offer Tile Grout Spreader to our clients. These are qualitative in nature and are an adhesive spreader and grout profiler. One can easily spread grout quickly and evenly. Reckoned as an illustrious business enterprise, we are keenly affianced in delivering to our patrons Notch Trowel at affordable price. use to trowel the thin set mortar. - overall head size is 11" x 4 1/2"
- Trowel size: 6" & 4"
Owing to our knowledge and massive understanding in this sphere, we have been readily immersed in offering to our esteemed clients a quality assured Notch Trowel. - High tensile anti-rust treated spring steel blade with 2 mm, 4 mm & 6 mm notches. Owing to the rich industrial experience and expertise in this domain, we are engaged in presenting Notched Trowel. 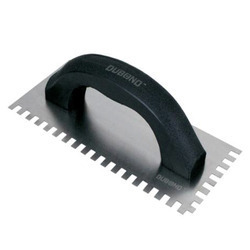 A Hand Tool For Tile And Aac Block Adhesive Application, Material Saving, Time Saving, Level Maintaining Device. Note: Product May Differ From The Picture Shown. Regal Paints & Brush Pvt. Ltd.